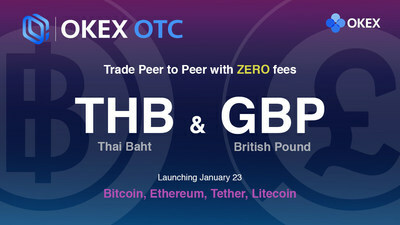 VALLETTA, Malta, Jan. 23, 2019 /PRNewswire/ — OKEx, the Malta-based world-leading digital asset exchange, announced to launch two new currencies – Thai Baht (THB) and British Pound (GBP) on its over-the-counter (OTC) trading platform (also referred to as fiat-to-cryptocurrency platform). Users in Thailand and the United Kingdom can now complete KYC verification to be eligible to trade on the OTC trading platform. “Our mission is simple at OKEx. We aim to offer flexibility and convenience to our traders. Thailand and the UK own the fastest growing crypto communities in the world. We see great potential in these two markets and want to support the needs there. Because of the increasing trading volume and number of traders in these two countries, we decided to launch the new THB and GBP trading services on our OTC trading platform. Wherever the market potential locates, we will expand to there. In 2019, you can expect more currencies will be supported on OKEx,” said Andy Cheung, OKEx’s Head of Operations.